Laserworld has launched the Laserworld EL-500RGB KeyTEX show laser light. 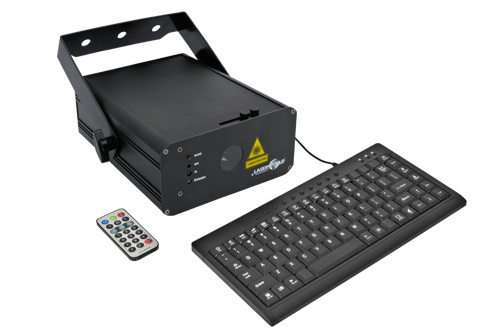 This RGB device is not only a normal laser system including stand-alone mode, sound-to-light mode and DMX, but it also comes with remote control and a keyboard for entering texts and animating these texts or patterns. Up to now Laserworld already offered a very popular successor of the newly launched show laser. The ES-400RGB had very similar features but the new one offers more features like the text function. The Laserworld EL-500RGB KeyTEX is not just a text laser but a full laser system for entertainment purposes without using additional laser software. It is possible to run the laser in the ‘normal’ scanner mode or to slide a diffraction grating into the beam outlet to multiply the projection and to cover a much wider angle. The multiplied patterns or texts cover surfaces with a RGB cluster effect. Especially for mobile DJs, smaller clubs, night clubs or private parties, the Laserworld EL-500RGB KeyTEX is very interesting since it is easy to operate, is capable for projecting tunnel effects, layers and some basic shapes and figures. Most important is the feature to write custom messages and running texts in single or multi colors. The Laserworld EL-500RGB KeyTEX has a very reasonable price-performance ratio and is available in the Laserworld online shop as well as at many Laserworld distributors.